Looking for a way to save those herbs so you can save money too? Check out these great tips! If you have ever shopped for herbs at the grocery store, you have seen how pricey they can be. Not to mention, they may not always be fresh. These are two of the reasons that growing your own herb garden is such a great idea. But what happens when you grow more than you can manage? You can only cook so many meals a day. You don’t want to waste those lovely fresh herbs, so what do you do with them? Of course you can give them away, as family and friends will gladly accept them from you! But if you want to be sure you have some on hand for the fall and winter months, take a look below at some clever ways to save those herbs for later. When you grow fresh herbs, you have quite a few options for making them last. This way during the cooler months, you can still enjoy your tasty herbs in your daily cooking. You hate to resort back to buying wilted and pricey herbs at the grocery store, right? Then take a look at how easy it is to save those herbs for later and get more life out of them. 1. Put your food dehydrator to use. If you have a food dehydrator, you can dry your herbs and easily store them for later. Just rinse your leaves and lay them flat on the trays. Turn your dehydrator on and let it do the rest. When done, you can store in airtight bags or containers either in crushed form or whole. If you don’t have a dehydrator, you can always go the old fashion way and hang them. When you hang your herbs, you just gather a bunch, tie string around the bottom, and hang upside down. Allow them to hang in a sunny and dry place for 1-2 weeks until crispy. Then, just store as mentioned above, either in a container or air tight bag. 3. The paper towel method. Wash your herbs and lay them flat on a paper towel. Place a paper towel on top and press lightly. Apply another layer of herbs, and press another paper towel gently on top. You are going to continue this, creating layer by layer until all of your herbs are gone. Keep out in a dry place where the herbs will dry, then crumble and store. 4. Pop them in the freezer. Herbs will last up to six months in the freezer if you blanch them first and then store them in a freezer safe bag or container. If you choose not to blanch you can still store for about three months in your freezer. Just use a safe container to avoid burn. This method is brilliant. 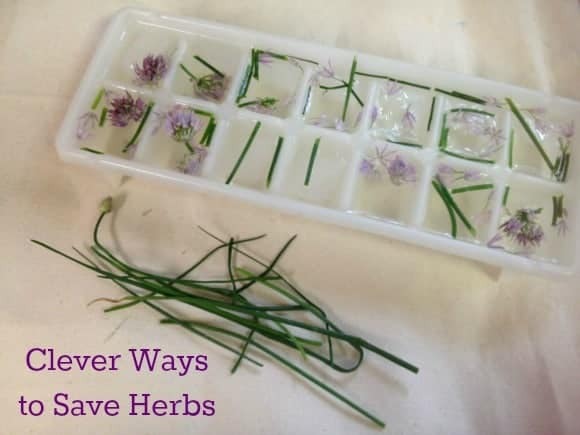 Just fill an ice cube tray with water and drop in a few herb leaves into each. Freeze. When you need to add herbs to a recipe, just toss in a cube. The cube will melt and your herbs will be tasty and fresh! You can put your microwave on defrost, place a cup of water in it, and place the herbs on a towel next to the cup. Yes, this is a bit complicated, but still a viable option. Don’t skip any of these steps as in doing so you can damage your herbs or your microwave. Try heating in 1 minute intervals until dry. Crumble and store. Add some herb stems and leaves to your favorite olive oil. It will infuse it with extra flavor. Use your oil in marinades, dips, or even for coating pans when you cook meat. It makes it tasty and the herbs will hold up well in the oil. When it comes time to use any of your herbs, use them in the crushed form you left them in or just let them defrost. They may not be the most attractive color, so you will avoid using them as a garnish, but they are still full of flavor and perfect for your cooking. If you find yourself with an abundance of herbs, try a few of these methods to make them last longer. You will be so happy when the cooler months come and you still have home grown herbs on hand to add to all of your recipes and favorite dishes. When you freeze your herbs you continue to get more bang for your buck, and avoid having to run out to the grocery store where you are sure to spend more. So which one of these methods will you choose? My favorite is to hang dry. I do it to my flowers too. I love to make potpourri with it. I never knew you could put them in ice cubes. Great list. Great advice! I love preserving my herbs from my garden. That whole 1st sentence… totally me!!! Im trying this! I never would have even thought to do this! I love fresh herbs but just never take the time to buy them because I just don’t have time to do the steps needed to keep them fresh or preserve them for later use. I will have to give your tips a try. I’d never heard of the ice cube tray idea. Love it! Excellent ideas! I am the queen of not using up my herbs, so these are just what I need.